The motto here is "Eat What's Fun". 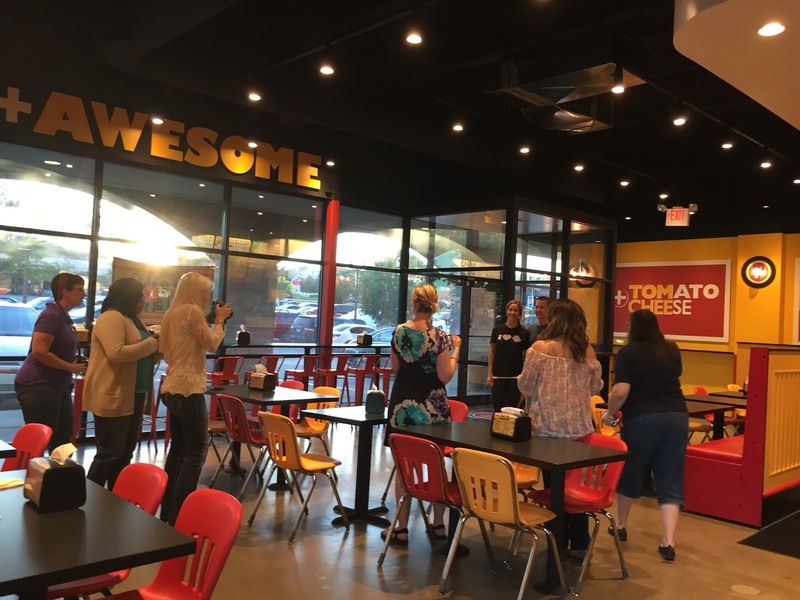 So while it's not the most grown up grilled cheese experience I've ever had, the kid in you (as well as any actual children you may have dining with you) will get a kick out of Tom + Chee. Plus, the menu and ability to customize sandwiches is vast enough that even after three visits, I still feel like there's a big chunk of options I haven't explored. 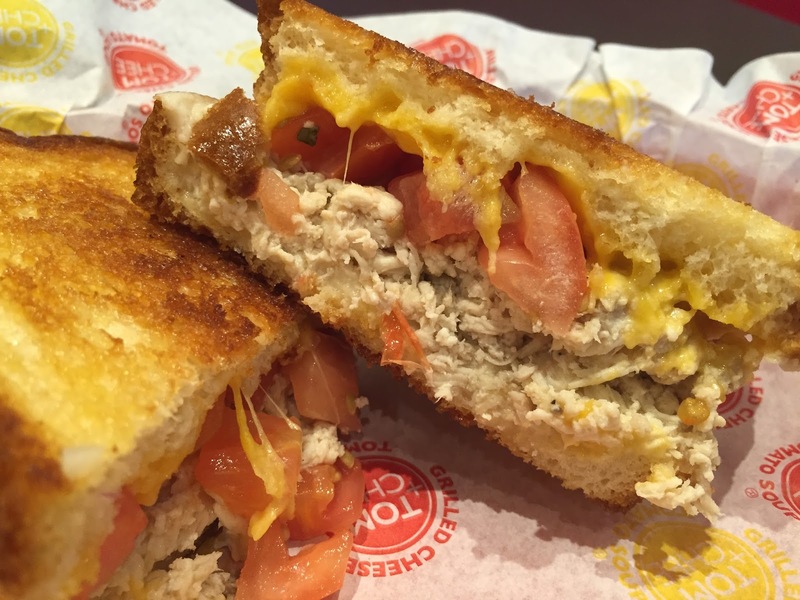 I'm one of those who first heard of Tom + Chee from their Shark Tank fame. Really, this is a great success story for the owners. 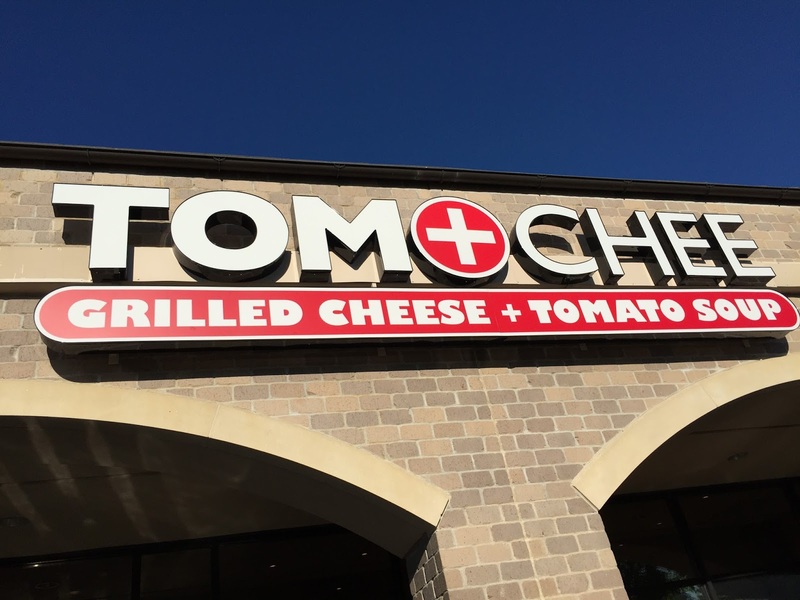 And while the idea of a tomato soup and grilled cheese restaurant is an admirable one, I'd ultimately probably prefer Tom[ato] and Chee[se] as they started in 2009... a small tent-based operation run by two couples in Cincinnati's Fountain Square. 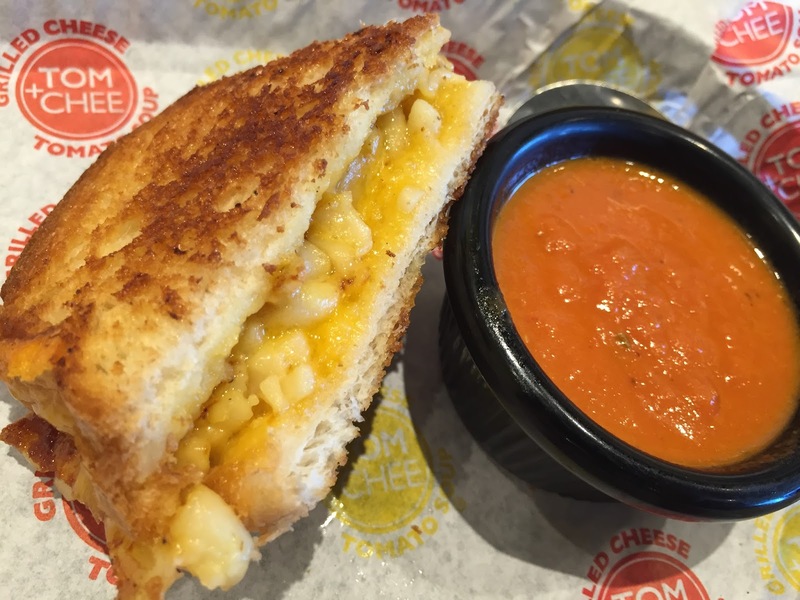 For me, I wonder if franchising has perhaps diluted some of the "je ne sais quoi" that made the original Tom + Chee's food so special (though the brand obviously remains strong). 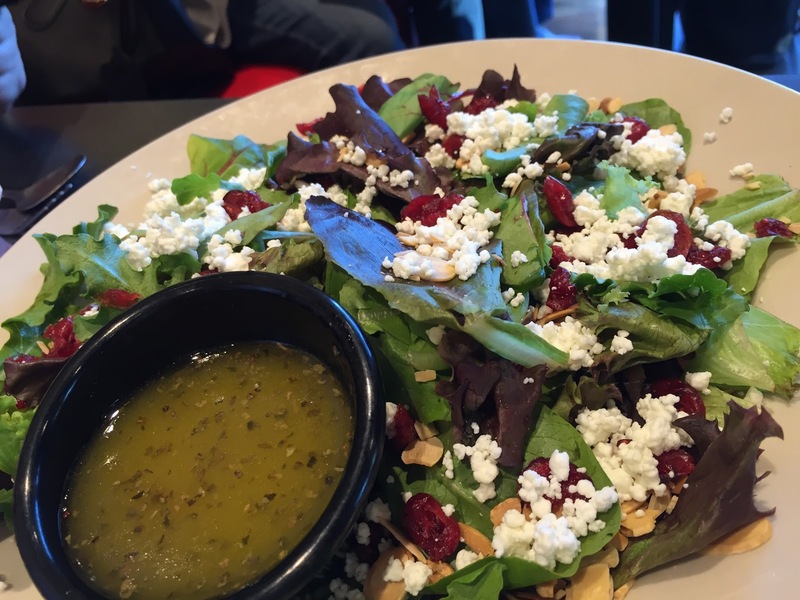 When it comes to the menu, there's quite a bit going on. It might not hurt to read up beforehand a little so you're not caught gaping at the board and holding up the ordering line. All told, there are 4 soups, 4 salads, 9 grilled cheese donuts and 15 sandwiches (plus a "make your own" option). You can also order 'dippers' of the soups - perfect! And adding pickles is free! Wee! It's impressive that Tom + Chee not only caters to vegetarians (obviously) but also offers gluten-free bread, vegan cheese, and makes their pesto with sunflower seeds (for those with tree-nut allergies). Until my visit is never had pesto prepared that way before (to my knowledge) but it was a perfect stand-in for the original recipe. Worth mentioning: the first visit (and all others at the time of this writing) were gratis as part of a blogger promo event. Not that T+C is hard on the wallet, by any means, you could get a full meal here for right around $10 - and Tuesday nights kids eat for $1. Speaking of which, I'm supposed to give away some stuff! 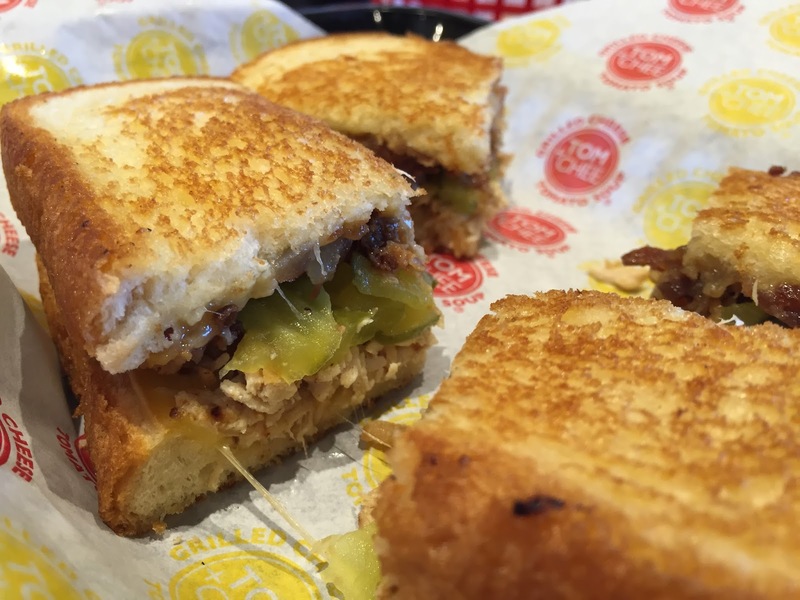 Four Readers are going to win some Tom + Chee coupons. You can enter using the widget below. 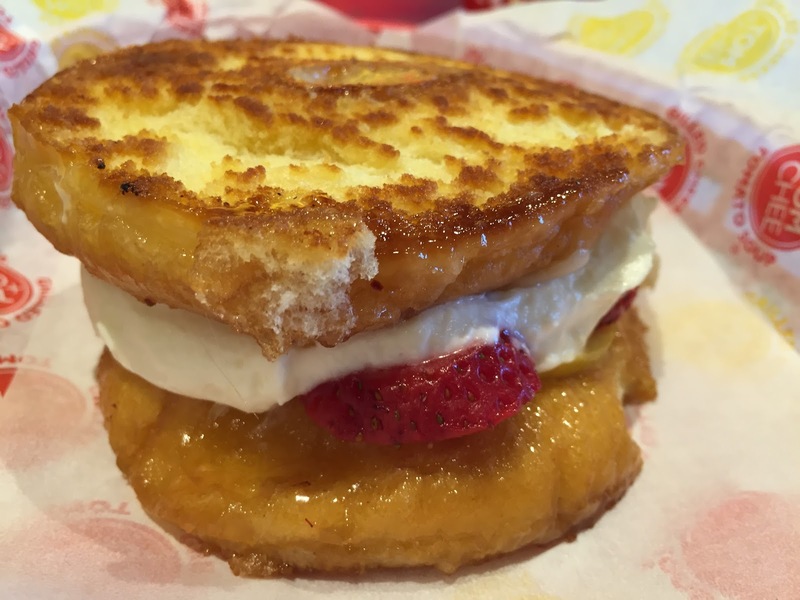 Over the course of my three visits I sampled 3 soups, 2 salads, 3 grilled cheese donuts and 9 sandwiches. While many of the sandwich descriptions spark interest, there were only a couple real standouts. But along the same vein, there was only one disappointment (sorry, Cookies & Cream donut cheese). Flying Pig, their most popular sandwich (Roasted Turkey+Bacon+Pickles+Gouda+Sourdough) was also probably my favorite as well. At that point it's not so much a grilled cheese as a toasted sandwich, but the house-roasted meat had a great flavor that was nicely complimented by the pickles and cheese. And the one day I picked out my own... Out of all possible crazy concoctions, I ended up with cheddar, mozzarella, roasted chicken, & diced tomatoes. Essentially their standard Tom + Chee sandwich (minus the garlic, which I read in the OWH was potentially a little overpowering) plus chicken. All in all, it was A-OK. If I'm going to pay for something I could make at home, typically I want it to either be crazy good - or just plain crazy. Just plain crazy means donuts with bacon and cheese or the combinations that make you go... "Hmm". These are things like the Blueberry Blue (Blueberry Compote+Blue Cheese+Lemon Mascarpone+Donut) or the fact that you can add potato chips to any sandwich do some extra crunch - though that can dwindle unless you're a quick eater. Maybe the craziest thing of all? That they also serve a pretty decent fresh caprese salad. 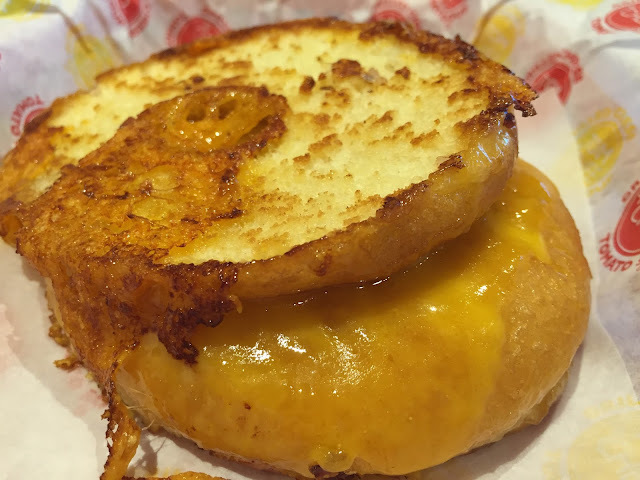 So while they definitely have the crazy covered at Tom + Chee, I don't know if I can fully say it's "crazy good". Nor can I really get behind the moniker of "gourmet". A far more accurate description is what pops up on Google, "No-frills local chain serving creative takes on grilled cheese sandwiches, tomato soups & salad." All that being said, Tom and Chee is still plenty good. I wouldn't hesitate to visit again (and again). I just wouldn't let yourself get too excited about it because there's nothing worse than disappointment.